On our farm, I try to make things instead of buying them. While part of that is about living a more natural, real-ingredients life, the other part is that I just don’t really like leaving my house. It’s just my personality. If I can make it at home, I’m more apt to do that than run out to the store to buy an item. That’s why I love 101 Easy Homemade Products For Your Skin, Health & Home, a book by Jan Berry that without a doubt lives up to it’s name. 101 Easy Homemade Products For Your Skin, Health & Home teaches you how to make every day items, like soap, shampoo, salves, lotions, and other health-related products from herbal ingredients you probably have growing in your backyard. For someone like me, it’s pay dirt because I can make soaps for me and salves for my livestock, and all the recipes are housed in one simple resource! If you’re like me, and are interested in making your own homemade herbal products, then 101 Easy Homemade Products For Your Skin, Health & Home is for you. 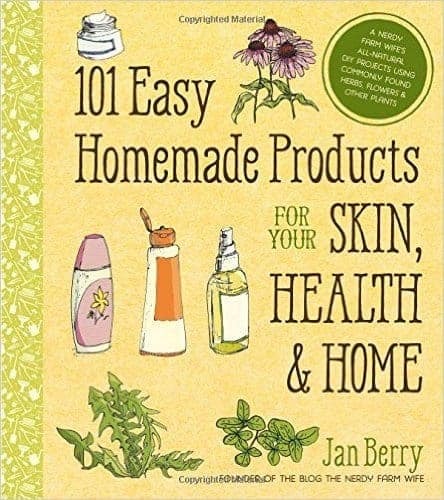 101 Easy Homemade Products For Your Skin, Health & Home is a 256 page, full color book by Jan Berry of The Nerdy Farm Wife blog. It’s published by Page Street Publishing, Co. The book is priced at $22.99 (less on Amazon), and it contains—wait for it—101 recipes that teach you how to make homemade products using herbs as well as healthy ingredients like coconut oil, beeswax, and shea butter. Recipes include tutorials about how to make soaps, shampoos, bath melts, lip balms, as well as herbal remedies like salves, throat syrups. You’ll also be invited to discover recipes for all-natural laundry detergents and wall washes. At the beginning of the book is a full explanation of the ingredients, their beneficial uses, and tutorials about, for example, how to infuse oils with herbs to use in the recipes. You’ll also find a detailed Table Of Contents, which makes it easy to flip to exactly the recipe you want. 101 Easy Homemade Products For Skin, Health & Home is one of those resources you absolutely want on your shelf if you’re trying to avoid chemicals. You’ll find natural alternatives (that actually work) to products like shampoos and lotions, which tend to be full of unrecognizable ingredients if you buy them at the store. One particular feature I like about the book is that Jan lists alternative herbal ingredients in case you don’t have access to certain herbs. For example, I wanted to test out the “Peony & Orange Sugar Scrub” but I don’t have ready access to peonies. However, roses were offered as an alternative, and since I received this book to review when roses were abundant on my homestead, I was able to safely substitute roses for the peonies and end up with a wonderful sugar scrub. You’ll also find alternatives for carrier oils and butters. For example, I don’t have ready access to mango butter, and the book offers plenty of other choices that also work well within the limits of the recipe. You’ll also discover little-known nuggets of information about common flowers and herbs. For example, before reading 101 Easy Homemade Products For Skin, Health & Home, I wasn’t aware how valuable all the violets growing on my front lawn really were. In 101 Easy Homemade Products For Skin, Health & Home, you’ll discover a recipe for Violet Leaf Lotion Bars, and the leaves are a wonderful source of vitamin E.
There’s also recipes for animals, and one of my favorites, and one I tested out, was a rose salve for livestock. On my farm, this was a wonderful addition to my natural first aid kit, and it’s extremely useful for our chicken flock. The recipes are easy to follow, and many of the recipes also have accompanying photos for reference. I don’t have anything negative to say about 101 Easy Homemade Products For Skin, Health & Home. This is a resource you will turn to time an again. 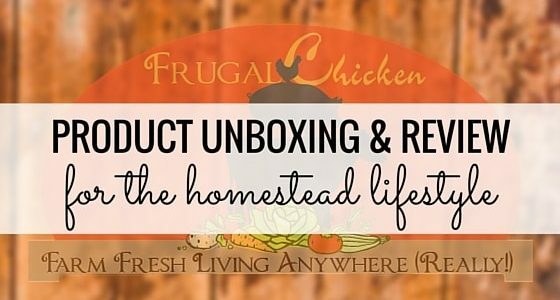 For the list price of $22.99, you’re getting a valuable resource for your homestead. If you’re a DIY person who is trying to avoid chemicals, then this book is absolutely a must-have. Do you think you’ll read 101 Easy Homemade Products For Skin, Health & Home? Leave a comment below! You’re welcome, Jan, it’s a great book!